Intravenous therapy or IV therapy is the fastest way to deliver fluids and medications throughout the body. 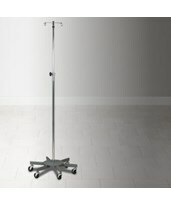 At Tiger Medical we want to provide our customers with the IV poles needed to deliver quick and efficient IV care. We have an IV Pole to match all your needs and budgets. 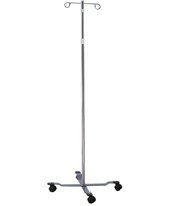 We offer a wide selection of poles from top of the line brands like Clinton Industries, Brewer and Drive Medical. 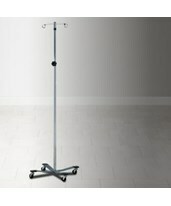 Our IV poles come with two, four or six hooks. 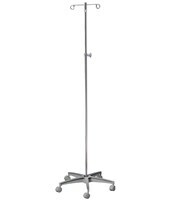 Check out our economy lightweight models and heavy weight aluminum base models. We offer models with knob lock adjustments or twist lock adjustments. All of our IV poles are made from high quality materials that are reliable and durable. 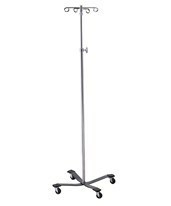 Space saver IV poles are great for tight floor space featuring a 16" base. Low gravity bases offer extra stability for heavier loads. 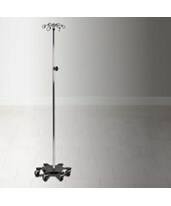 Check out our IV pole accessories that will enhance your IV care. 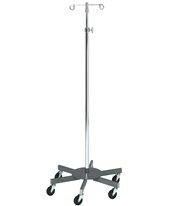 We offer an IV steering handle to aid in moving and controlling the IV pole. The color key IV pole end tips are great for color coordinating IV poles per floor. If you have any questions while browsing our selection please call our friendly customer service for assistance! Available with 2-Ram's and 4 Ram's Horn Hook. Handles up to four infusion pumps and/or IV controllers. Tough six-leg epoxy coated steel base. 6 leg epoxy coated steel base. Tough four-leg epoxy coated, 22" steel base. Rubber wheel, ball bearing casters. Rubber bumpers on legs to protect walls. 2-Ram's and 4 Ram's Horn Hook. 4 leg epoxy coated, 22" steel base. Rubber bumpers, ball bearing casters. 2 Ram's and 4 Ram's Horn Hook. 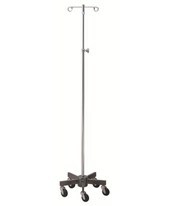 Five-Leg, 25" cast aluminum base.